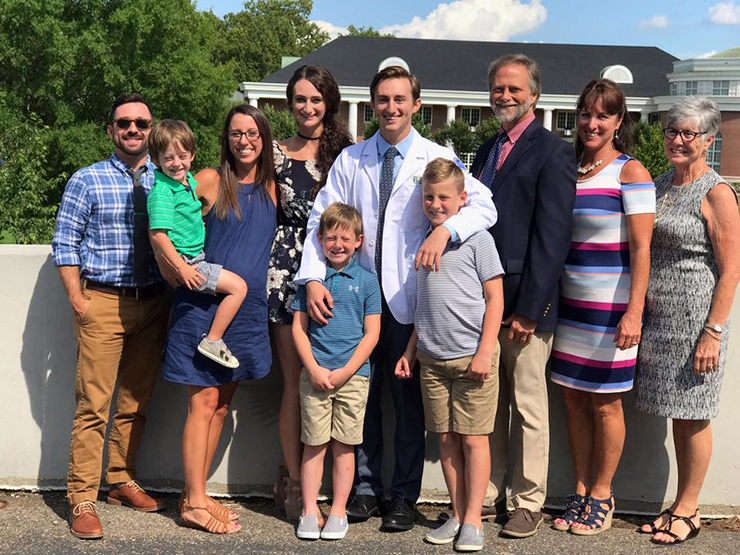 Andrew, pictured with his family after his white coat ceremony at Ohio University. Andrew Hill ’16 enrolled at Malone as a psychology student who was interested in emotional and mental health. During his sophomore year, Hill realized God was calling him to something different than Hill had imagined. This decision came to him while sitting in a human biology class taught by Cynthia Johnson. Students planning for medical school typically major in chemistry or biology, but Hill remained true to his passion and continued with psychology, then added chemistry as a minor. This approach, he reasoned, afforded him a unique perspective when working with patients. He also determined that the study of psychology would be a valuable asset to set him apart from other medical school applicants. Professor of Chemistry Jeff Goff became a mentor and friend to Hill. Hill is a student at Ohio University’s Heritage College of Osteopathic Medicine. He is still discerning his specialty, but, he said, he knows he is where he belongs.